The move by the Wisconsin congressman sets off a scramble for leadership of House Republicans. WASHINGTON — House Speaker Paul Ryan abruptly announced Wednesday that he will retire rather than seek another term in Congress as the steady if reluctant wingman for President Trump, sending new ripples of uncertainty through a Washington already on edge and a Republican Party bracing for a rough election year. The Wisconsin Republican cast the decision to end his 20-year career as a personal one — he doesn’t want his children growing up with a “weekend dad” — but it will create a vacuum at both ends of Pennsylvania Avenue. It will leave congressional Republicans without a measured voice to talk Trump away from what some see as damaging impulses, and it will rob Trump of an influential steward to shepherd his more ambitious ideas into legislation. 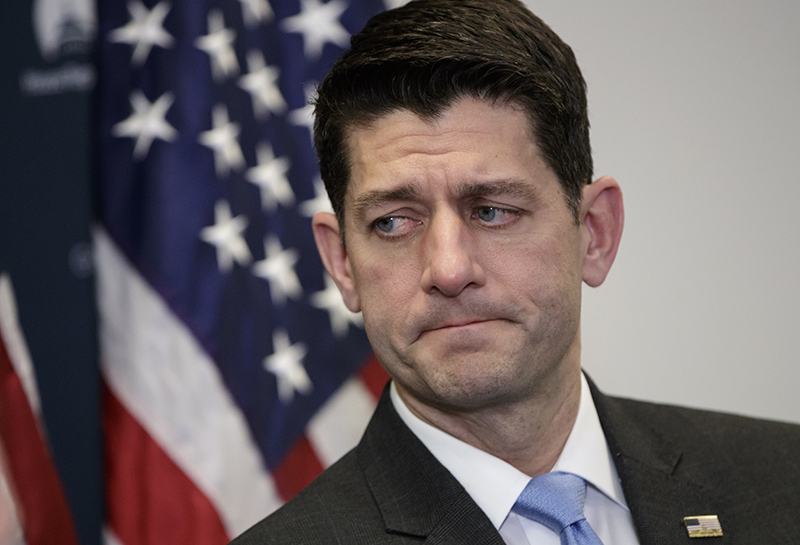 It’s unusual for a House speaker, third in line to succeed the president, to turn himself into a lame duck, especially so for Ryan, a once-rising Republican star who is only 48 and was the party’s vice presidential candidate in 2012. His decision fueled fresh doubts about the party’s ability to fend off a Democratic wave, fed by opposition to Trump, in November. And it threw the House into a leadership battle that could end up pushing Ryan aside sooner than he intended and crush any hopes for significant legislation before the election. Ryan, though, said he had no regrets after having accomplished “a heckuva lot” during his time in a job he never really wanted. He said fellow Republicans have plenty of achievements to run on this fall, including the tax cuts Congress delivered, which have been his personal cause and the centerpiece of his small-government agenda, even though they helped skyrocket projected annual deficits toward $1 trillion. “I have given this job everything I have,” Ryan said. Speculation over Ryan’s future had been swirling for months, but as he dialed up colleagues and spoke by phone with Trump early Wednesday, the news stunned even top allies. Ryan announced his plans at a closed-door meeting of House Republicans. Rep. Mark Walker of North Carolina said an emotional Ryan “choked up a few times trying to get through” his remarks and received three standing ovations. He later briefly thanked Trump in public for giving him the chance to move Republican ideas ahead. While Ryan was crucial in getting the tax cuts passed, a prime Trump goal, he and the president have had a difficult relationship. Trump showed impatience with Congress’ pace in dealing with his proposals, and Ryan had to deal with a president who shared little of his interest in policy detail. The speaker had been heading toward this decision since late last year, said a person familiar with his thinking, but as recently as February he had considered running for another term. His own father died suddenly of a heart attack when he was 16, and though Ryan is in good health, the distance from his family weighed on him. A final decision was made over the two-week congressional recess, which he partly spent on a family vacation in the Czech Republic. Ryan, from Janesville, Wisconsin, was first elected to Congress in 1998. Along with Reps. Eric Cantor and Kevin McCarthy, he branded himself a rising “Young Gun” in an aging party, a new breed of hard-charging Republican ready to shrink the size of government. He was Republican presidential nominee Mitt Romney’s running mate in 2012. Ryan was pulled into the leadership job by the sudden retirement in 2015 of Speaker John Boehner, who had struggled to control the chamber’s restless conservative wing. He has had more trust with the hardliners in the House. House Majority Leader McCarthy, a Californian known to be tighter with Trump, is expected to again seek the top leadership post that slipped from his reach in 2015. He will likely compete with Majority Whip Steve Scalise of Louisiana. Both men spoke at the closed-door meeting Wednesday, delivering tributes to Ryan, and both attended a GOP leadership dinner Wednesday night with Trump at the White House. Another potential rival, Rep. Mark Meadows of North Carolina, a member of the conservative House Freedom Caucus, demurred when asked if he’d pursue the speaker’s job. “Leadership has never been on my bucket list, and it’s not on my bucket list today,” he said. Ryan’s announcement came as Republicans are bracing for a potential blue wave of voter enthusiasm for Democrats, who need to flip at least 24 GOP-held seats in November to regain the majority. As the House Republicans’ top fundraiser, Ryan’s lame-duck status could send shockwaves through donor circles that are relying on his leadership at the helm of the House majority. He has hauled in $54 million so far this election cycle. But a top Republican fundraiser, Eric Tanenblatt, expects Ryan to remain a force in a tough cycle. “Donors who are committed to making sure Republicans hold onto the majority will do whatever they have to do to make that happen,” he said. Senate Majority Leader Mitch McConnell, who has worked with Ryan, praised his colleague’s tenure. The Democratic House leader, Nancy Pelosi of California, said she hoped Ryan would work constructively on bipartisan goals before he leaves. In Wisconsin, Republicans had no obvious successor in waiting. The most likely GOP candidate for Ryan’s seat is state Assembly Speaker Robin Vos, Republicans in the state said. Another Republican mentioned as a potential candidate is longtime Ryan family friend and backer Bryan Steil, an attorney and member of the University of Wisconsin Board of Regents. Democrat Randy Bryce, a colorful ironworker who has cultivated an “IronStache” moniker, had been Ryan’s best-known challenger, drawing liberal support from around the country. He had nearly $2.3 million in the bank at the end of the first quarter. Janesville teacher Cathy Myers has also been running on the Democratic side. The only declared Republicans are Paul Nehlen, who was banned from Twitter earlier this year for posts criticized as racist or anti-Semitic, and Nick Polce, an Army veteran who also co-owns a security consulting firm.